E-sports or electronic sports is slowly gaining fame but it still has a long way to go to be entirely accepted by our country. The problem is that there is a stigma that comes with E-sports; most people think it is only a distraction for students, which can be true, without the right discipline. But with today’s gaming scene, that stigma is being forgotten. In the past years, we witnessed how fellow Filipinos battled top teams from all over the world in major gaming events which took place in local soil. And yes, may ibubuga tayo dito. Another thing that changes that stigma is the newly opened High Grounds Café: a restaurant, a coffee shop, and an internet café in one! (and I thought Friday and Saturday nights spent gaming were already perfect. High Grounds is beyond perfect.) It provides a place for parents to chill out while their kids are battling it out virtually. This gaming haven is run by a world-famous Philippine gaming team and it has 110 top-tier PCs connected to an ultra-fast internet connection that can reach up to 500mpbs. The venue even has a battlefield look that boosts the players’ spirits making it a breeding ground for the next generation of Philippine e-sports athletes. If you’re having a rough week, this is the perfect way to destress. 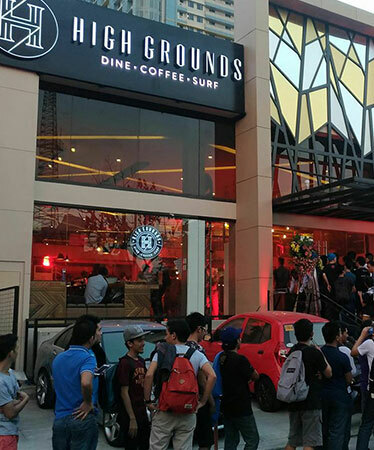 Visit High Grounds Café at 67 Scout Rallos St., Tomas Morato, Quezon City and up your game a notch.